In 2012 The Timber Staircase Association was formed. The formation of the Timber Staircase Association (TSA) was to give the UK's timber staircase manufacturers a voice in the interaction of what is going on in the industry in the way of standards and regulations. Stairplan became a member with the initial membership and the manufacturers within the TSA currently account for around 60% of the staircases currently produced within the UK. As Stairplan's continuing program of improvement to and goals in providing the highest quality staircases available in the UK to a mass production level, whilst providing a product using timber from sustainable sources we believe membership with the TSA to be beneficial to Stairplan. 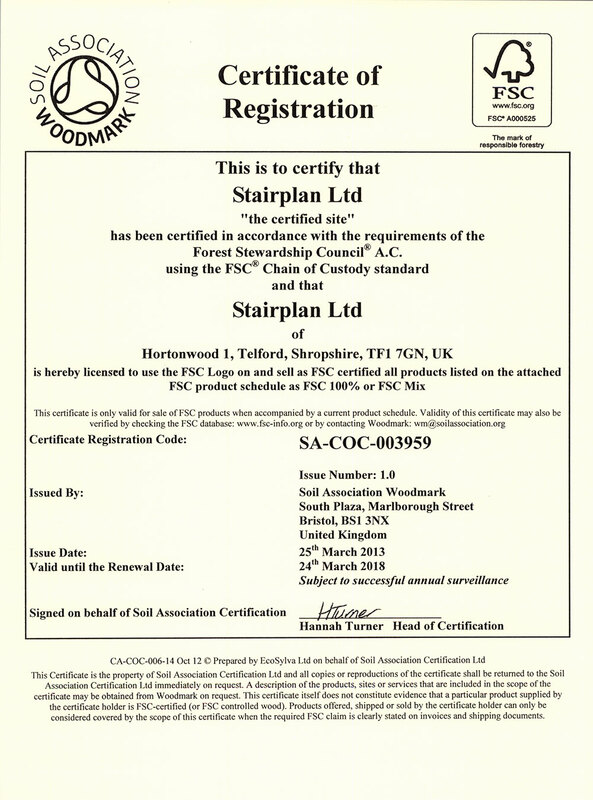 Stairplan are no longer members of the British Woodworking Federation Stair Scheme, you can find a copy of our certificate on the following line. Stairplan operate a responcable timber programme and are operate the chain of custody system. Stairplan have now achieved the ISO 9001 Quality Management System certification.